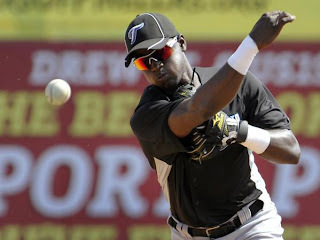 Scouting Report: Adeiny Hechavarria was signed by the Blue Jays after he defected from Cuba, and at the time Toronto knew exactly what they were getting: a dynamic defensive shortstop with a major league ready glove but a questionable and aggressive bat. Hechavarria does have a 3/4-to-sidearm delivery on some of his throws, causing them to tail off at the end, and will need to be corrected down the line. His reaction time is extraordinairy, and when accompanied with his speed it gives him great range at shortstop. While there is some belief Hechavarria could develop power down the line, his frame doesn't provide a lot of room for additional muscle so it's unlikely his power will develop much further. His athleticism is unquestioned, so Hechavarria's biggest roadblock to reaching the majors will likely be bat. 2010 Analysis: Hechavarria got a late start to the year as he spent much of the first month of the season in extended spring training. He was initially assigned to Dunedin, Toronto's High-A affiliate, due to it's proximity to the Blue Jays Florida facilities as well as it's age-appropriate level of competition. Hechavarria struggled dramatically, with a .509 OPS in 41 games. Surprisingly, he earned a mid-season promotion to Double-A New Hampshire, which was later revealed to be heavily based upon New Hampshire manager Luis Rivera and his spanish speaking coaching staff -- something Hechavarria didn't have in Dunedin. His performance improved all around, with a .665 OPS over the last 61 games of his season. While the offensive performance was still below expectations, the defense came as advertised, as Hechavarria drew the attention of many scouts and prospect gurus for his outstanding glove. Future outlook: Hechavarria started the 2011 season with Double-A New Hampshire, and will likely spend the entire year there. For Hechavarria to make it as a major league shortstop his bat will need to be more competent as it is now, and it's likely the Blue Jays would like to keep him away from the launching pad in Las Vegas in order to maintain an accurate indication as to whether he's improving or not. 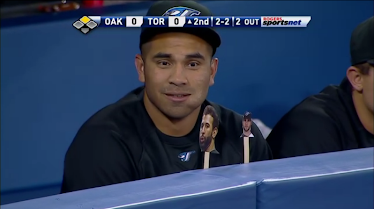 If his bat improves as the year moves along, he may begin 2012 in Triple-A with a possible September 2012 promotion to Toronto. Perfect world projection: Everyday MLB shortstop, hitting at the top of the lineup versus lefties, at the bottom versus righties. Worst case scenario: Bounces between Triple-A and the major leagues on a variety of teams hoping he can figure out his bat. Most likely outcome: Part-time MLB shortstop getting 200-300 AB per year, defensive replacement and pinch runner late in games.